A case which recently came before the New York Appellate Division granted an injured worker’s summary judgment motion, finding a property owner liable for the worker’s injuries after a fall from a ladder under a law mandating safety protections for employees working at an elevation. In the case of Hill v. City of New York, plaintiff Nicholas Hill was injured while working on the premises of C & C Meats Corp as an HVAC mechanic, installing an overhead refrigerator unit. Hill had ensured that the ladder was steady, then climbed to the sixth rung of the eight-foot ladder to begin working overhead. Hill had not been provided with a safety harness while working on the ladder. Although his coworker had been in the room at first, he left to grab a pipe fitting. While the coworker was gone, Hill’s ladder wobbled, causing him to lose his balance and fall backward. In fact, the owner of C & C Meats watched the accident on the facility’s security video after, and testified to the fact that the ladder wobbled to the right, then to the left, and eventually went too far, causing Hill to fall to the ground. After the fall, Hill noticed that the ladder was missing two of its four rubber foot pads, which he guessed had caused the ladder to wobble. Hill filed a lawsuit against C & C Meats and the City of New York (the owner of the property which leased the space to C & C Meats) for his injuries, claiming that C & C Meats had failed to uphold its duty under New York Labor Law to provide safety restraints while Hill worked on the ladder. Hill filed a motion for summary judgment, asking the court to conclude that the defendant was liable for this violation without going through a full trial on the issue. Hill’s motion was denied by the trial court, but granted by the Appellate Division. C & C Meats attempted to argue that Hill was required by 240(1) to prove that the ladder was defective if he wanted to make a successful claim, but the court ruled in its opinion that Hill only needed to show that “his injuries were the direct consequence of using a ladder that did not provide adequate protection” to make a valid claim under that law. Since it was established that Hill did not receive a safety harness or other fall protection while working on the ladder, he had met his duty to show that C & C Meats had failed to comply with § 240(1). 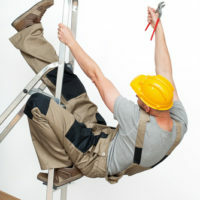 If you were injured on the job in New York in a fall from a ladder at a construction worksite or other type of ladder fall accident, seek the compensation you deserve for your injuries by contacting the knowledgeable and dedicated New York City workplace injury attorney Leandros A. Vrionedes for a consultation on your case, in Manhattan at 212-889-9362, and in Astoria at 718-777-5895.